Even though I haven’t posted anything for a while, I’ve been keeping busy. 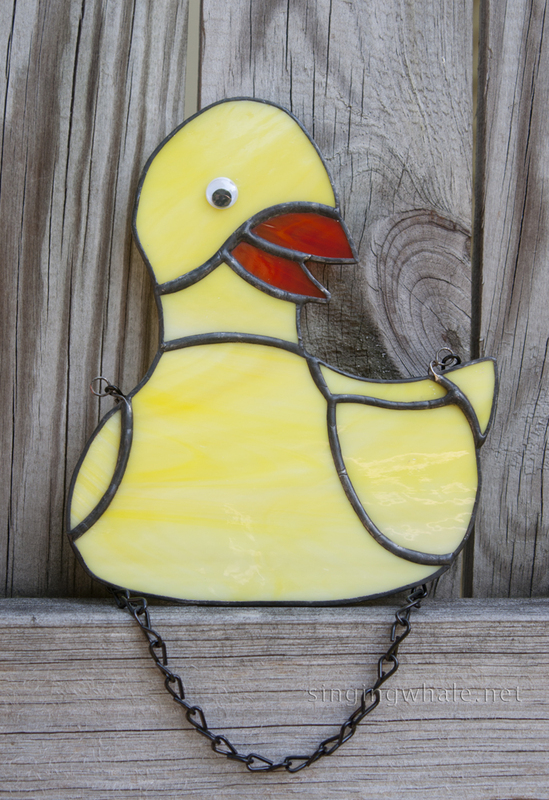 I have several new patterns in development as well, but I wanted to end the silence by first posting about this stained glass yellow rubber ducky that I made in late July. I could not post about it until now because it was a gift for a friend whose baby just arrived a short while ago (congrats, Kat and Justin!). 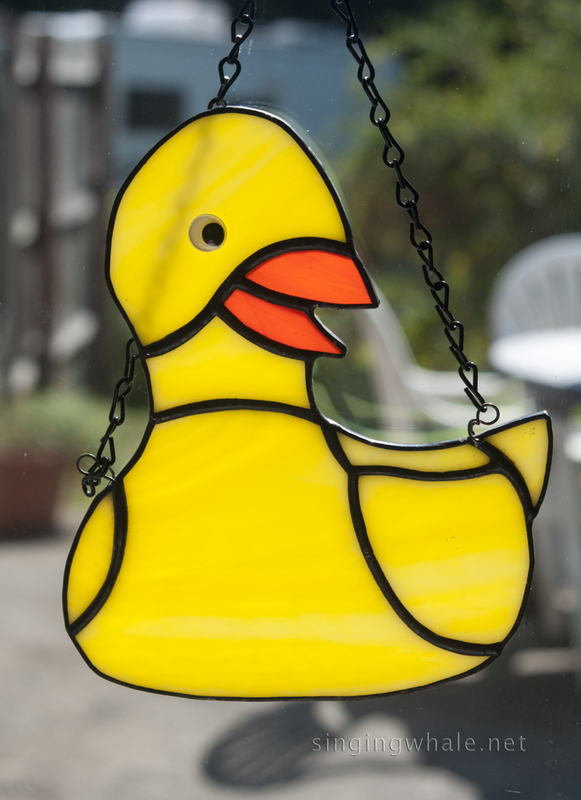 The ducky was commissioned by Kat’s mom, as the nursery was decorated in yellow ducks. I went around on line to look at various patterns available, and wasn’t thrilled with any of them. 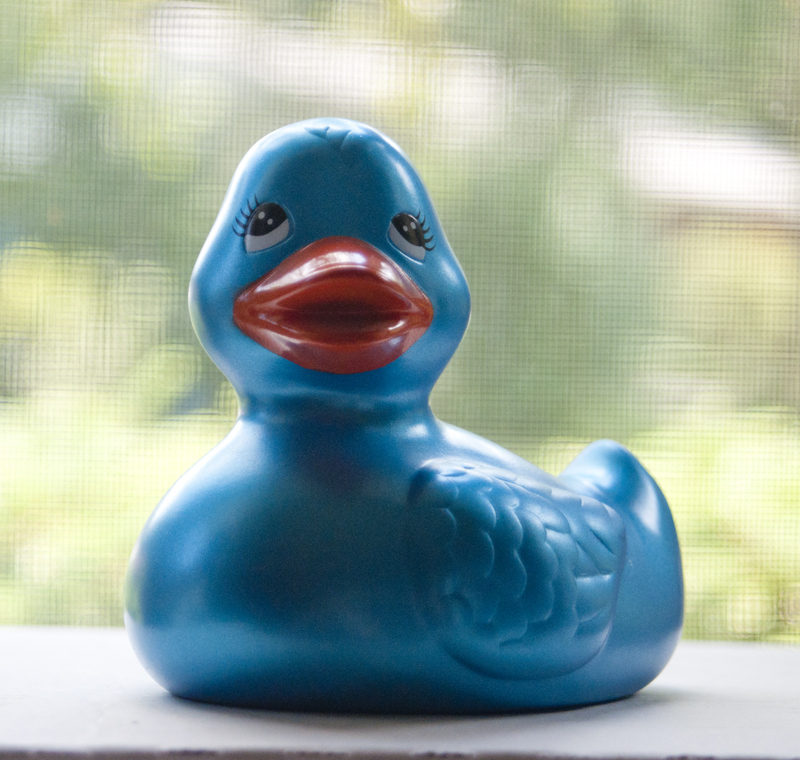 The shape of the duck makes it bottom-heavy by default, and I wanted to make sure I constructed one which was not going to separate as a result. I didn’t really want to do a panel-type of piece, ducky and background, just a ducky. 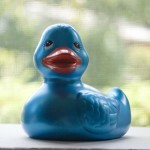 Luckily, I had a rubber ducky of my own, in ‘electric blue’ I call it. So I grabbed my camera and took a bunch of photos. I wound up using a composite of two photos to get the side wings and angle of the head, allowing for good seams in which I could add hooks for chain, and also giving the piece a bit of personality. I am pretty happy with the result, and Jill (Kat’s mom) was as well. If Kat and Justin ever catch up on sleep, I’ll get their reactions, too. So far, I have made just the one ducky, in the traditional yellow, but it can certainly be made in other colors, too. 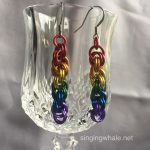 The piece measures approximately 6 1/2″ wide and about 7″ long. I have black jack chain on this one for hanging. I used a fairly dense but still translucent yellow and white wispy glass for the body which just glows when the sun is behind it. The beak is an orange wispy glass. Cost is $30 each. This entry was posted in animals, new works, suncatcher and tagged glass ducky, rubber ducky. Bookmark the permalink.